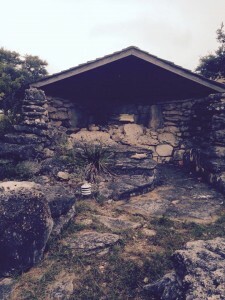 This stable was shelter for 6 Marys and no children. One Mary talked quietly to herself, shuffled back and forth with coffee. 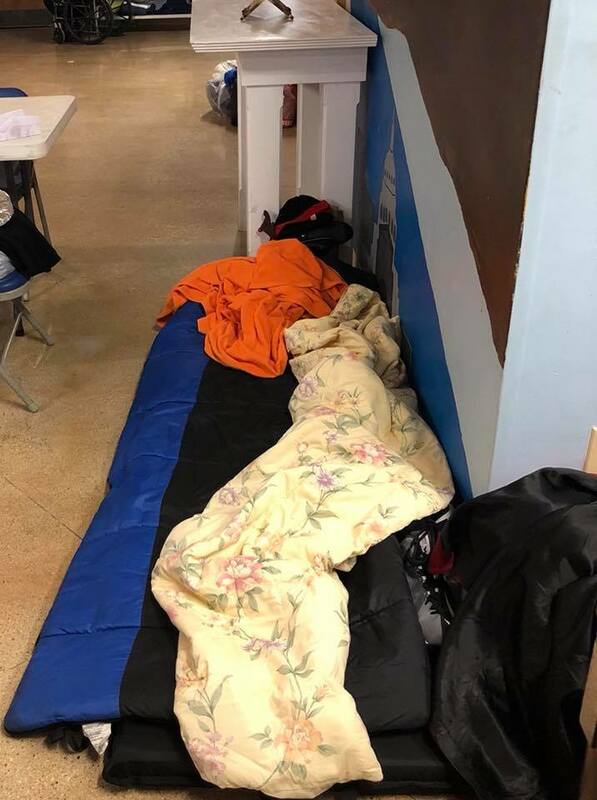 She had a small backpack and two large garbage bags full of clothing and blankets. Another Mary has diabetes and made her way around in a wheelchair. She has open sores on her hands and she wants to die. But she came in from the cold to sleep here, so there is still some survival left in her. There were two quiet trans-Marys eating breakfast and and complaining bitterly about having to go back outside. It could have been because of the cold weather or the cold treatment out there. Three layers of sweaters can only protect you from so much. A fifth Mary thanked everyone for her bed and her food. She was helpful and cheerful…until she was not. Something set off a memory and she traveled down an angry tangent while packing her belongings. I’ve heard her mention her children before, she’s lost custody and is trying, trying, trying to see them again. The last Mary was quiet. Hardly a peep. Silently slept, silently ate, silently packed. Silent night. Was it a holy night? 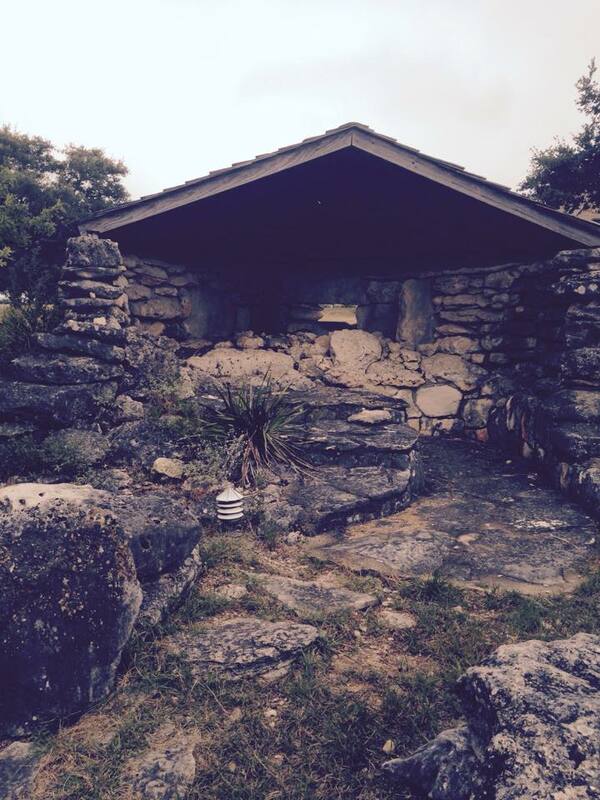 This stable was shelter for 6 Marys and no children. But all of them are somebody’s child. Y’all!!! There has been a fashion explosion at Maryology! This is exciting to the extent that you take “fashion” with a grain of salt. As an antidote to my work this summer, I decided I needed to get a little crafty – use a totally different side of my brain. So I made a skirt using a pattern I found here. 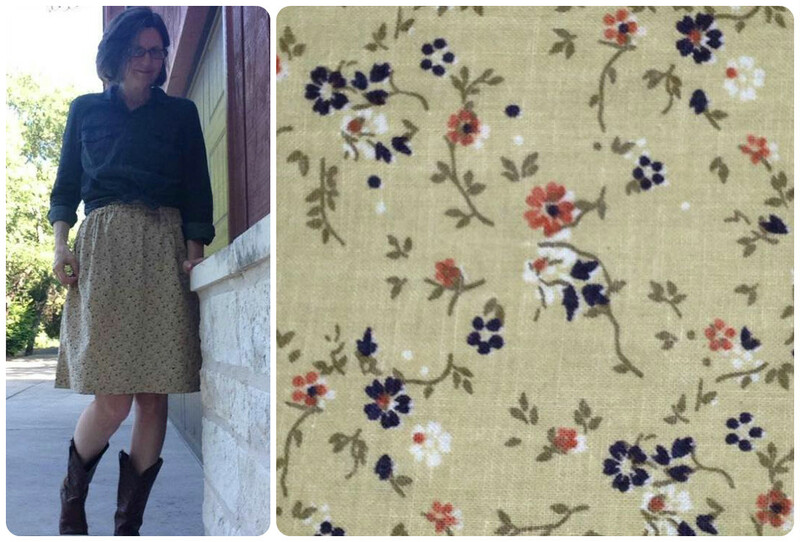 It is a very easy pattern, which is why it took me almost two years to make the skirt. (That’s how long ago I announced to friends I was definitely making it.) And now I have a skirt that I can wear with boots – which means I have almost everything it takes to front an Austin band. Next, I needed a new computer bag. One with wheels because I carry almost everything I own with me – and my old bag was breaking my back and shoulders. 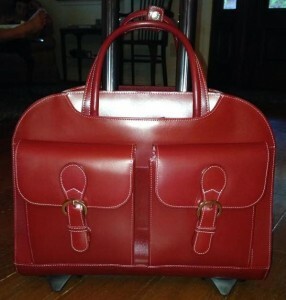 A red leather computer bag. I need to fly somewhere just so I can stroll this baby through an airport. Maybe I can hang out in front of a conference room and pretend to be at a meeting of people with important-looking computer bags. 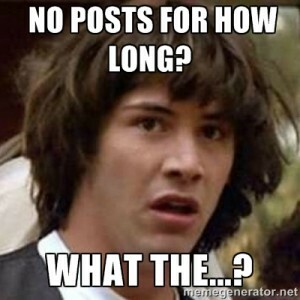 Has it really been so long since my last post?! That has got to change. I have had a couple of really interesting and divergent thoughts about palms this week. To me, they have only ever been symbolic of two things: Palm Sunday hosannas and the beach. 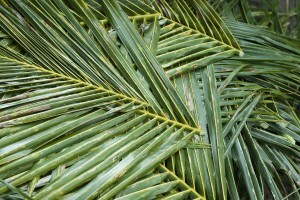 This morning was all about the palms of Holy Week. Our Sunday morning service started outside with (mostly) children waving palm fronds up in the air. 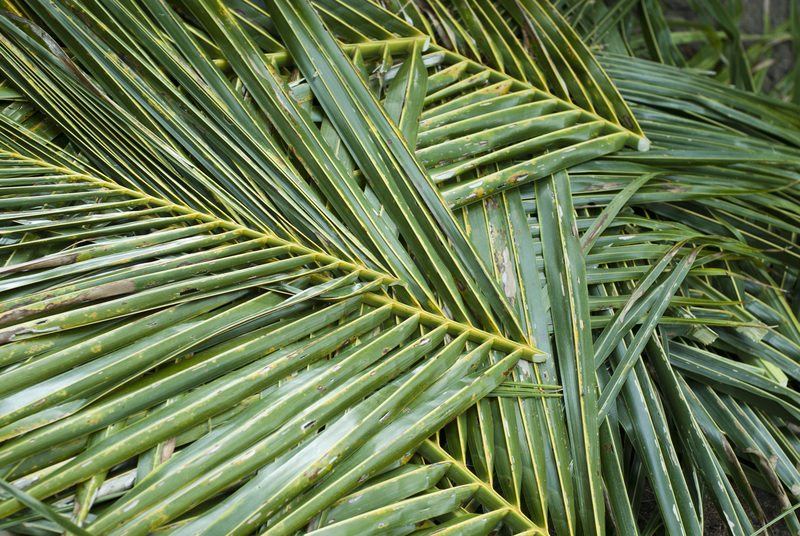 There was the annual whispered warning from parents that palms fronds are not swords – although as the story of Holy Week unfolds we find that, indeed, they are. Palms held up in praise and welcome are soon fists in the air. While you are marching in the Palm Sunday parade, it is easy to get caught up in the celebration; but before you know it you end up at the courthouse calling for blood. And then there is this: Before Holy Week even started, I had become part of a discussion about palms in a completely different context. With a group of women – half of us Muslim, half Christian – I have been learning about Mary/Maryam in the Quran. The mother of Jesus is highly revered in Islam and is, in fact, the only woman referred to by name in that holy book. 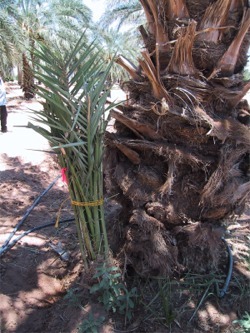 Growers (and legend) say that the baby palms must stay near the mother tree for 6 to 8 years or they will die. (I looked it up online – it is true!) The fruit of the date palm contains a number of essential nutrients and is eaten to break fasting during Ramadan, and many of my study companions gave a taste of date to their newborn children even before giving them milk. These images have been swirling in my mind as I try to reconcile them into a single metaphorical holy image. That hasn’t happened. But I know that the crowd that raised palms for Jesus came from a culture in which the palm was highly symbolic for multiple reasons – all of them in some way affirming of life, victory, peace, and hospitality. Under the shadow of this symbol a most horrific act of betrayal occurred on Maundy Thursday and Good Friday. Learning about Maryam and date palms gave me a little comfort for the hard week ahead. In the Quran, palms provided Mary shelter and nourishment as she gave birth alone in the desert, and I think of her keeping the treasured child close until he is old enough to be planted in his own soil. It is a very feminine metaphor for the divine. This week, I imagine God is holding Mary close as she stands at the foot of another tree watching her son suffer and die. Birth, life, death, renewal. Fruit from the same tree. Yesterday, I met with an interfaith group of women–half Muslim and half Christian– to study Mary/Maryam in the Quran. My participation came as kind of a fluke – another woman in the group had to drop out, so a friend invited me to fill in. But it touches so many things I am interested in that I could not resist. And, you know, Mary. I need no other reason. 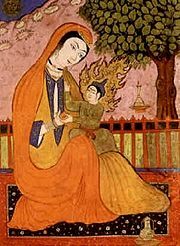 I knew that Mary was important in Islam, but our first meeting reminded me just how much. (It’s been more than 20 years since my class with Lamin Sanneh. Mea culpa for forgetting so much!) She is not only the mother of Jesus – a major prophet in Islam – but the only woman mentioned by name in the entire Quran. Each woman introduced herself to the group by saying what they most admired about Mary, each coming from her own tradition and life experience. Without exception, the Muslim women cited Mary’s chastity and strength as her most admirable qualities. The Christian women had a bit more variety, but tended more towards strength, bravery, and loyalty. Our inspiration is most certainly rooted in our own scriptural traditions. The stories about Mary have common elements in Islam and Christianity, but they are not the same. Already some differences in belief and tradition are surprising us. Mary lived in the Temple? And gave birth under a date palm tree? Say what?! No, she was a poor woman from a backwater town. And she married a guy named Joseph. Really! You can read what the Quran and the New Testament report about Mary pretty easily on the Internet. 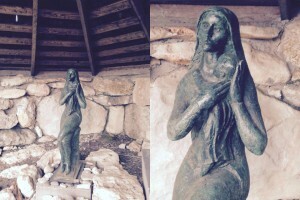 But what you won’t get are the individual expressions – verbal and facial expressions – as women meeting face-to-face try to articulate just what it is about Mary that stays with us. Over the coming weeks, we will read some passages from the Quran and discuss their significance, as well as share our various beliefs about Mary. 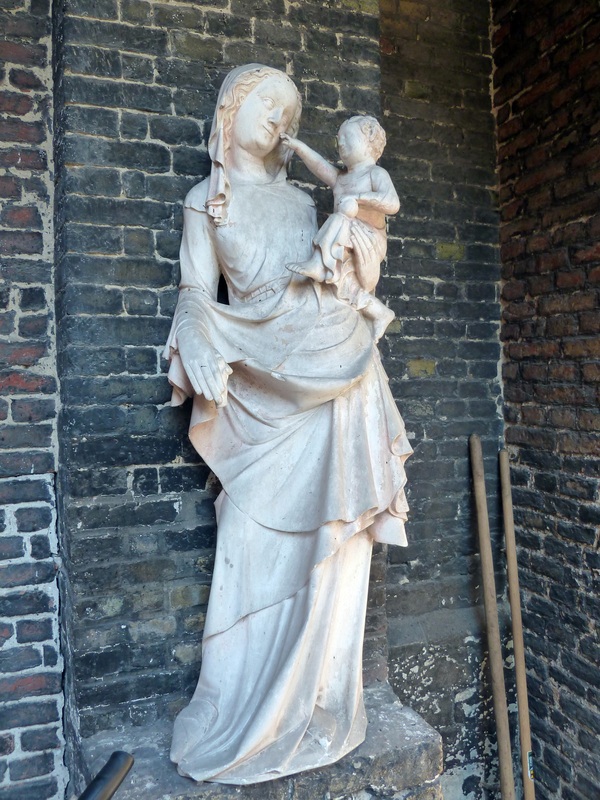 Those traditions are quite different in some respects, and yet there is something about this long-ago Mary that catches our attention and keeps it. She accepts the unexpected–a pregnancy, a miraculous child, a public life — with grace. Can’t wait to learn more. Today is the feast day of Mary of Nazareth, the mother of Jesus, the Blessed Virgin. 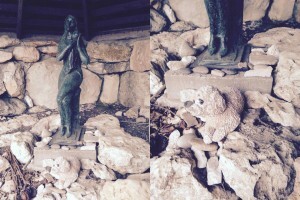 Some might think that it is about darn time that a blog called Maryology had something to say about this particular Mary. And, of course, I do. 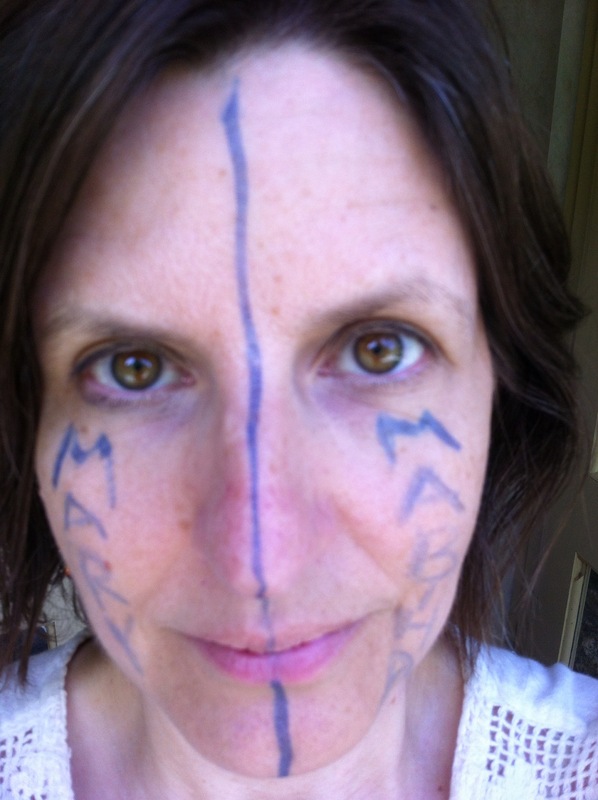 As a Mary, I have grown up feeling a little weird about Mary of Nazareth. Maybe some of you non-Marys have had the same experience. She always seems so aloof when depicted in art, all alone and stone cold. In hymns and sermons she can come off as simultaneously superhuman and inhuman–a role model that is impossible to emulate. A lot of it has to do with the emphasis on her virginity, her purity. The untouched and untouchable mother. A contradiction. Perhaps I should have just focused on the Mary in the Bible, because there she is not alone or cold at all. The biblical stories about Mary tell us about a woman–a girl in the beginning, really–who is never alone. She is with angels, her cousin Elizabeth, Joseph, shepherds, wise men, animals, children, and all the ragtag followers of her son, Jesus. Luke tells us she gave birth in a barn, for goodness sake. Becoming a mother myself made me think about her in a new way–there is really nothing very aloof or pure about giving birth or raising a child. There is a reason the Magnificat comes BEFORE the nativity. But what really thaws my feelings about Mary of Nazareth, is thinking about her as a middle aged woman (well, in her day late 40s might have been old age) following her 30 year-old son around the country as he preached and healed and taught. Walking for miles and miles on the dusty road with the disciples is not much at all like being perched on a pedestal. Neither is watching the execution of your child. It might have made her feel isolated, but at Jesus’ crucifixion Mary was not alone. She was with his other followers, all supporting one another and no one knowing what would happen next. As I induct her into the Hall of Marys, I am kind of glad that I waited this long to have Mary of Nazareth join this illustrious group of women. It wouldn’t have been right to have her there all by herself. Have you ever lived a metaphor? Something happens to you or you do something and then, after some time passes, you look back and think, “if that happened in a book or movie I would not believe it!” A totally trippy experience. A little overboard, I know. I did it again when he was three and four. And the thing is, I am crafty, but not really an artist. I don’t usually paint anything at all, much less decorative objects. But I couldn’t stop myself. Each year I added to the collection and put them all out on display for the holiday. Y’all, who makes a Tiffany egg? A crazy woman, that’s who. When my son was 5, I stopped. 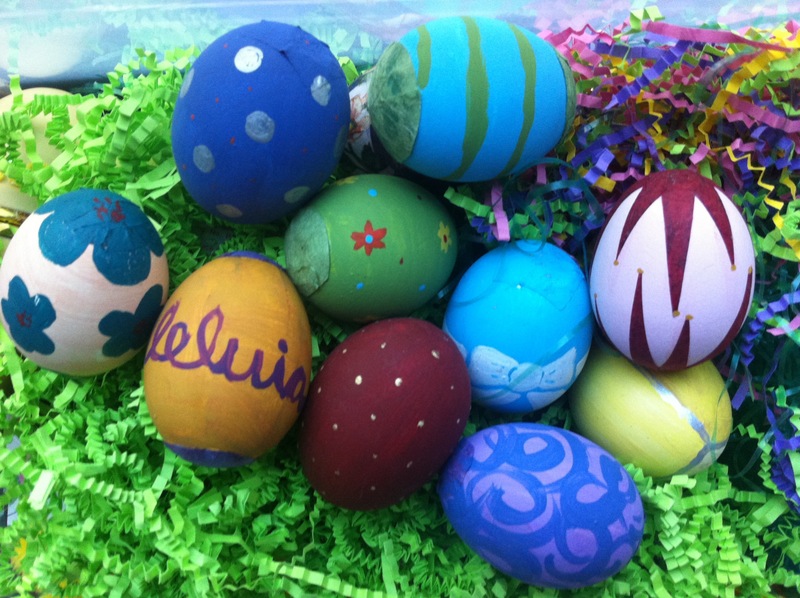 I was pregnant and he was in Kindergarten–they didn’t do the same Easter craft. I got out the eggs I had already decorated each year, but didn’t added any new ones. 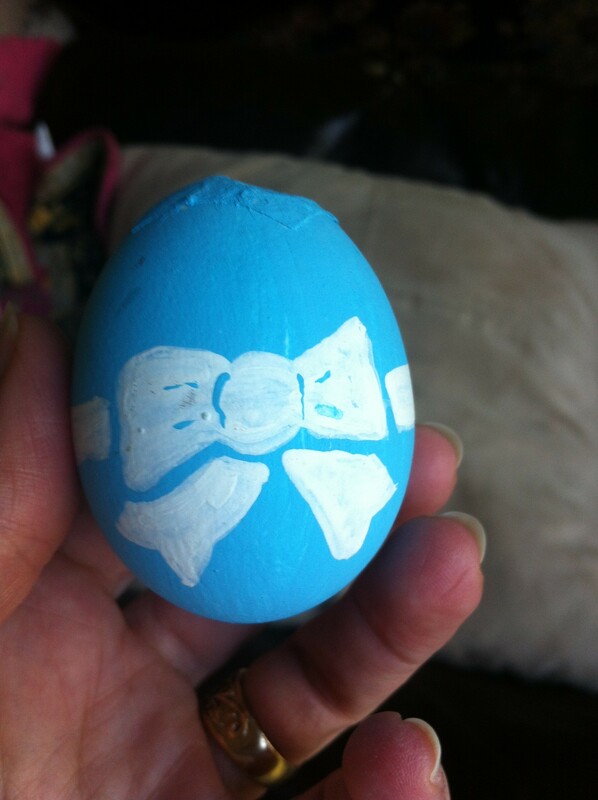 And I never painted another egg again. Okay, this is where it gets all metaphorical and weird. The whole time I was painting those fancy eggs I was trying to get pregnant, being treated for infertility, totally focused on EGGS. All day long, all cycle long, thinking about making more and more eggs. And before Easter for three years in a row, I painted eggs with a kind of obsession. I have no wisdom to add here. Really, I am just trying to figure out what my current habits mean.